For the fifth consecutive year, Texas is college football's most valuable team, and still growing. The last time Texas won a conference championship was 2009, but the Longhorns have been atop the college football world in another category since. For the fifth consecutive year, Texas is college football’s most valuable team, and still growing. The Longhorns are now worth $139 million, according to Forbes. Forbes says it determines college football team’s value by evaluating its value to its athletic department, its universityâs academic endeavors, its conference and its school’s local economy. Notre Dame checks in at No. 2 at $117 million, and Alabama ($110 million), LSU ($105 million), and Michigan ($104 million) round out the top 5. Texas is the only program in that group that hasn’t played in a BCS bowl since the 2009 season, and three have played in the BCS national title game. If that isn’t enough proof that football is bigger in Texas, the Dallas Cowboys are Forbes’ most valuable NFL team despite having just one playoff win since 1996. Texas head coach Mack Brown announced last weekend that he will step down after the Longhorns’ bowl game. Since playing Alabama in the 2010 BCS title game, Texas has gone 30-20 overall and 18-17 in Big 12 play. 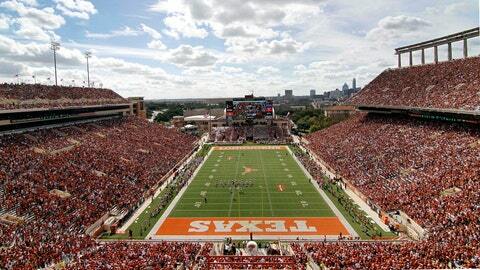 Imagine how much bigger Texas will get if the next head coach can take the program back to the top on the field.